Man. It’s been a hot minute since I did a cookbook review on my blog. And that’s mostly because I don’t look at many cookbooks. I’m always trying to come up with new recipes for you guys so cooking other people’s recipes doesn’t always fit into my schedule. 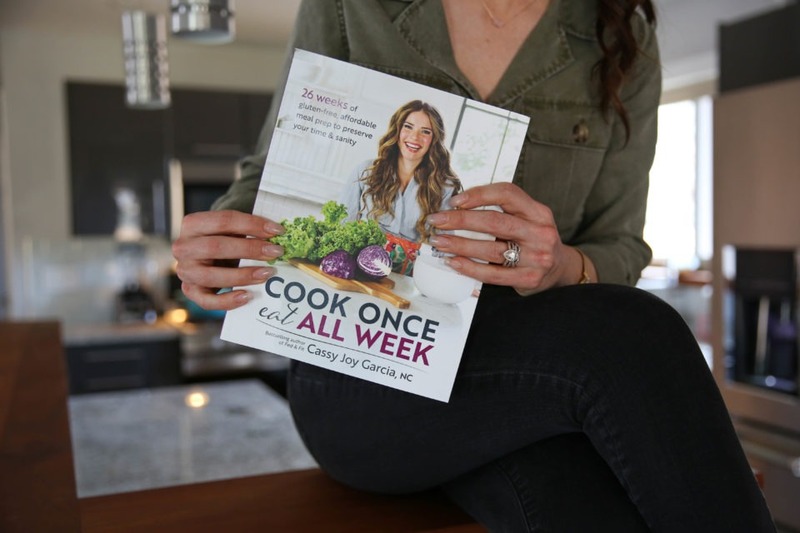 But when my friend Cassy Joy of Fed and Fit told me about her cookbook Cook Once, Eat All Week, I COULDN’T WAIT to get my hands on it and get to cooking. Cassy and I have been friends for probably 5 or 6 years at this point and she’s one of the hardest working women I know. She’s passionate, kind, and she fully commits herself to everything she does. And she does A LOT. When you open up this cookbook, you’ll know exactly what I mean. She has gone above and beyond in this book, all to make cooking easier than ever. 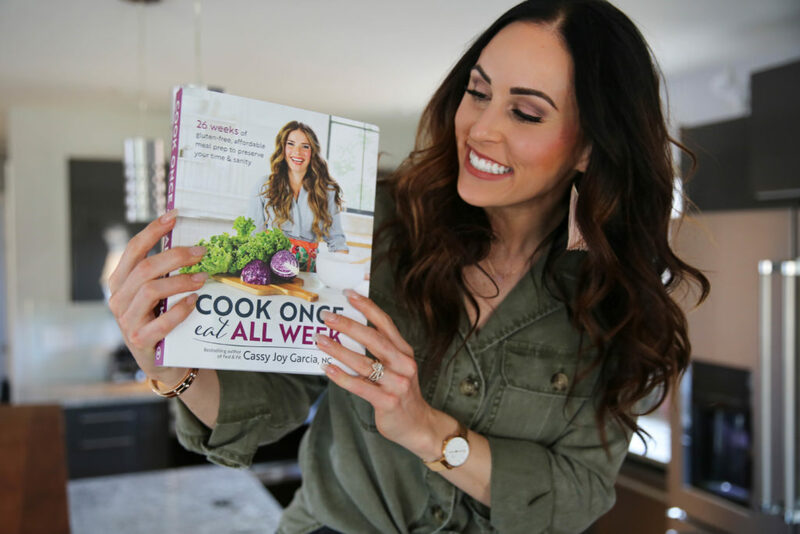 So here’s the breakdown of the book – The idea is you’ll have one prep day to get all your main ingredients ready to go – a protein, veggie and a starch – then you can make multiple different meals throughout the week with those three main ingredients. And the book gives you 26 weeks of recipes! Each week will look a little different, but everything you make will absolutely taste delicious. I’ve made many of Cassy’s recipes over the years and everything she makes is pretty simple yet so flavorful. She makes cooking simply easy! And this book is exactly that! It’s easy to follow, easy to create and easy to eat! 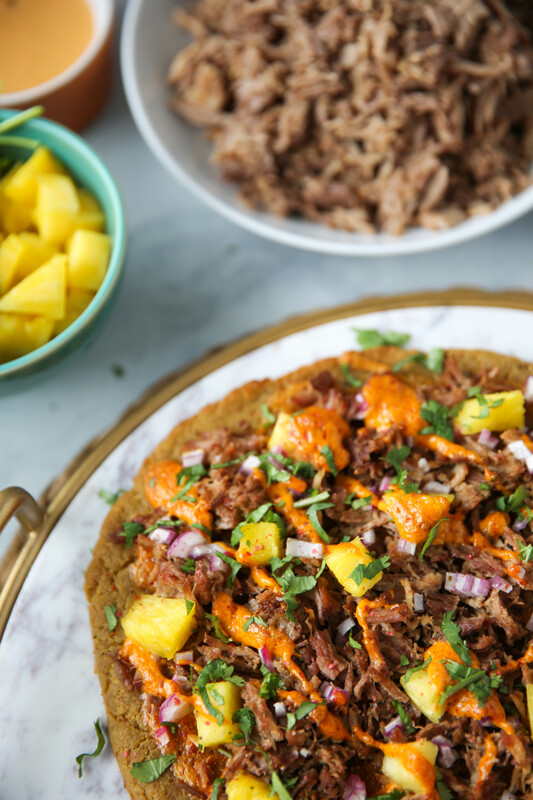 As soon as I saw Cassy make her Al Pastor Pizza on her instagram story with a crust made simply from plantains, I KNEW I would be making this recipe right away! And it was delicious! 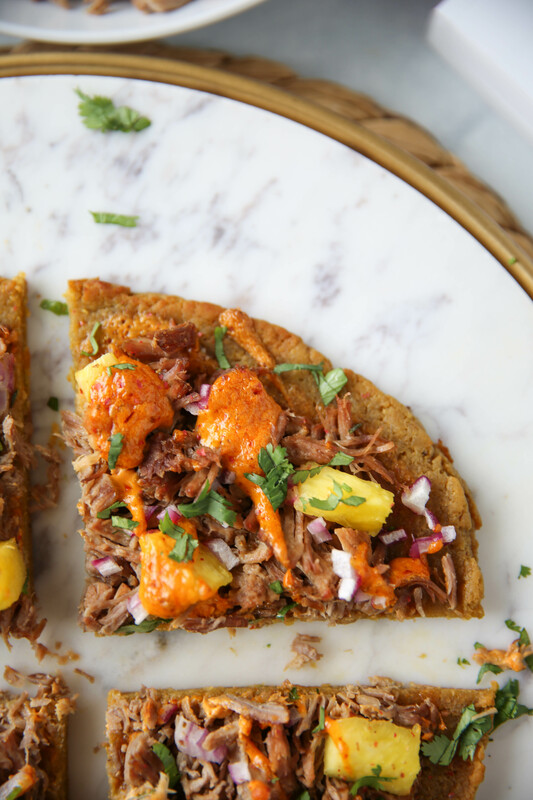 The pizza is topped with the shredded pork, an adobo sauce, pineapple, red onion and ALL the cilantro. Cassy is just as obsessed with cilantro as I am and I adore her for that. People who don’t like cilantro are the worst. Including my husband. 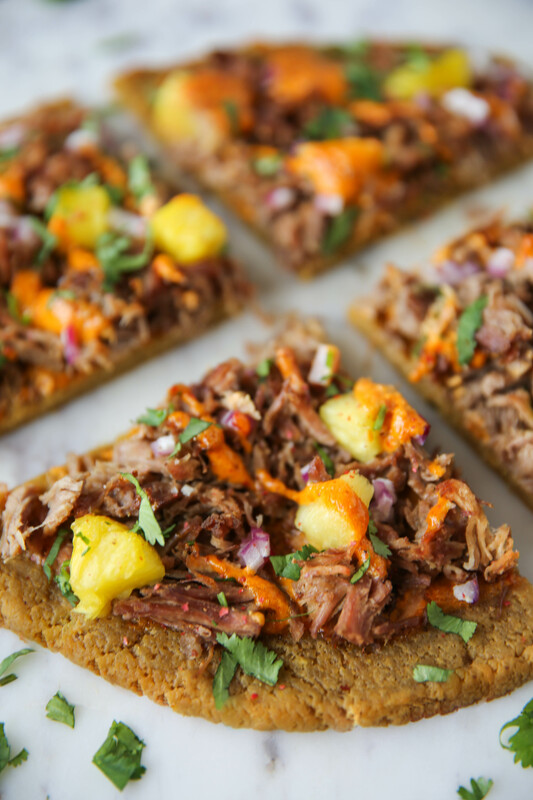 But if you’re crazy and Al Pastor Pizzas don’t call your name, here are some of the other recipes you’ll find inside. I seriously cannot wait to try them out! And in the back of the book, you’ll also find simple supplemental recipes (bonus dinners) for any nights when you need extra food in a pinch. In this chapter, you’ll find protein recipes, veggie recipes and starch recipes. Some of my favorite include Crispy Curried Chicken Thighs, Pan Seared Steak, Lemon-Garlic Shrimp, Crispy Brussels Sprouts, Lemony Kale, Pan-Fried Plantains, and Roasted Carrots. All these simple recipes make getting dinner on the table quick and effortless. Plus, Cassy even shares the nutritional information for every recipe in the book! She’s a freaking rockstar, you guys. I can’t emphasize that enough. I don’t think people truly understand how time consuming and stressful creating a book is. It takes so much time, energy and money, and authors are often just left hoping that they see a return. Cassy deserves so much more than just a return. She deserves to make the NYT Best Seller list, she deserves to get recognition for her hard work, and she deserves to have an amazing book tour along the way. She deserves it all. Period. She’s a great person who has made a really great book. If you do one thing today, please go support Cassy Joy!! Her book is available for preorder and is only $22.32 right now on Amazon!! For $22, you’ll get 123 delicious recipes, sauces and spice blends, meal storage and reheating tips, how to stock your kitchen, beautiful photos, nutritional facts, allergen charts, and a ton of other helpful tips! Her book releases on April 23rd, but preordering the book helps her chances of making NYT Best Seller! Let’s increase her chances together today by preordering her book!! I can’t say enough about this book and I can’t wait for you guys to see it! Click here to preorder your copy today and help support an amazing woman doing amazing things!! I already ordered mine three weeks ago!! Can’t wait to get the actual, physical copy!! I ordered mine a few weeks ago and I can’t wait until I get my hands on it! Cassy is great and I’m happy to support her! i pre-ordered mine the other day, i cant wait for it!! thanks so much Juli for introducing me to Fed & Fit, Cassy’s the best! I preordered mine the day she mentioned it was it would be coming out. I don’t even think there was release date at that point. I love her stuff! And I love successful women who support each other. So refreshing. We all bring different talents to the table. A wise, secure, unselfish woman (or man, too, I guess) realizes we can complement each other even if our roles (or blogs), or careers, may be similar. Doesn’t need to be cut-throat…. there’s ’nuff to go around! Thanks for the great review – Pre-ordering now. I have preordered this. Love the work of both of you and appreciate all your time and effort. Thanks!